The Lorenzo Cultural Center welcomes school field trips and provides links to resources for teachers at our Educational Resources page. The Lorenzo Cultural Center offers a range of opportunities for students to enhance their visit to the program series. Activities can be configured to the needs of your class. 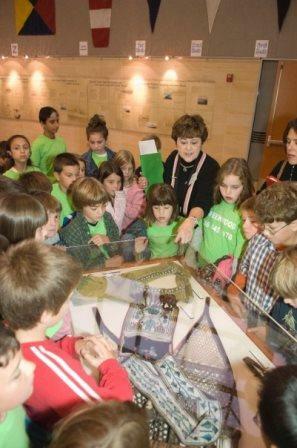 Most field trips include both a presentation and time spent in our exhibit. There is no cost for exhibit entrance, presentations or activities. Bus drivers: The Lorenzo Center is located on the Center Campus of Macomb Community College adjacent to the Macomb Center for the Performing Arts. Buses can pull up in circle drive to unload students, then wait in Parking Lot 4, directly across from the Lorenzo Center. There is no required ratio of chaperones to students. Please bring enough chaperones to supervise your group, and assist with the Scavenger Hunt if applicable. Registration is required for groups and availability is limited. Please call early to ensure your place—David Schroeder at 586.226.4759. Up to 25 people per group, 2 groups, total of 50 people, including teachers and chaperones. Up to 200 students plus chaperones and teachers. Students will use panels and artifacts in the exhibit to complete questions on a double-sided worksheet. Answers can be found in the exhibit as students explore. The scavenger hunt also compels students to think about and react to the exhibit by asking some open-ended questions that could be used for discussion or essay assignments in class. Please see our Printable Brochure for a full listing of presentations, workshops and lectures, led by locally and nationally known authors, professors, historians and performers. For information about which presentations are best for your students, please call David Schroeder at 586.226.4759. Find links to lesson plans, local resources, books, and websites to more fully explore the themes of the program series. Resources also include the exhibit text, which you could use with your students before or after your visit.